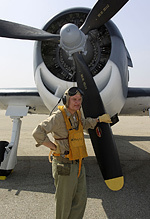 The theme for this year's airshow held by the Air Museum Planes of Fame at Chino airport to the east of Los Angeles was 'Salute to the Greatest Generation', and included a number of WWII veterans who were interviewed by journalist Joanna Hoppes Doolittle (Granddaughter of Gen Jimmy Doolittle) and broadcast over the PA system during breaks in the flying. 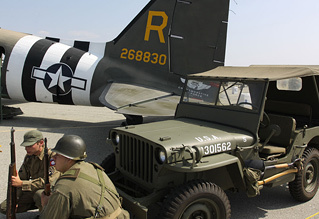 With sponsorship from the County of San Bernadino, the Museum once again pulled out all the stops to provide an excellent and unusual selection of aircraft to make this, once again, the largest Warbird airshow on the west coast. 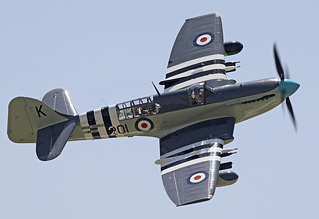 Mike Shreeve reports from California for UK Airshow Review. All photos by the author. 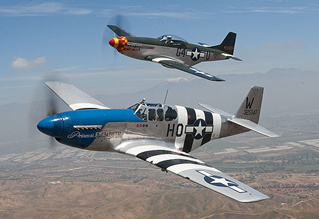 A total of 18 Mustangs attended the show, of which 14 took to the air as part of the airshow. 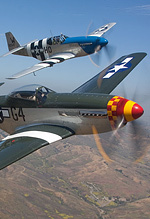 Notable Mustangs appearing included the Friedkin family's rare A-36, which made its first flight since appearing at Duxford's 'Flying Legends' show in 2003, in the capable hands of Steve Hinton, on the Thursday before the airshow weekend, after completion of a rebuild in the hands of Chino's 'Fighter Rebuilders'. A P-51D newly repainted in the markings of Bill Spengler's 'Buzzin Cuzzin' of the 78th FG based at Duxford was present, as was Spengler himself, part of a group of veterans which included fellow former 78th FG pilot Huie Lamb. 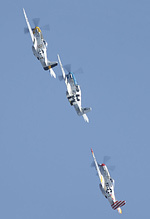 The show was opened by a flypast and tailchase by 10 of the Mustangs, including a rare trio of high-backed examples. As well as the Friedkin A-36, the Air Museum's Allison-engined P-51A kept it company, along with former Duxford-based P-51C 'Princess Elizabeth'. Another debutant at the show was the Air Museum's Yak-3, the rebuild of which was recently completed by Tom Camp at Hayward in Northern California. This aircraft is the former Yak C-11 once owned by The Fighter Collection at Duxford, originally acquired in the 1980s from the ex-Egyptian AF recoveries held by Jean Salis at La Ferté Alais, and later sent by TFC to Russia, along with the former OFMC example (now airworthy in New Zealand), for conversion to Allison-engined Yak-3 fighter spec. Later sold and shipped to Chino, the aircraft first flew on completion of its protracted rebuild a few weeks before the show, and was then flown to Chino for painting in a Normandie-Nieman scheme representing the aircraft flown by French Ace Marcel Albert. An innovation for this year's display was a mock Unlimited air race, comprising multiple Reno champion and much-modified P-51 racer 'Strega', Sea Furies 'Dreadnought' and 'Argonaut', a stock Bearcat and the Yak-3. The race, unsurprisingly, was 'won' by Steve Hinton Jr flying 'Strega'. 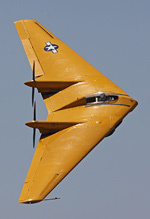 The Northrop N9MB Flying Wing also returned to the air a couple of days before the show, for the first time since being grounded after an in-flight engine fire in April 2006. This provided an unusual sight (and sound) in the air over Chino as it displayed its maneuverability during its well-flown display routine. Unlike the typical British airshow, much of the flying consists of groups of aircraft flying in a racetrack pattern making straight-and-level passes in the same direction in front of the crowd. This meant that a large number of warbirds were able to be in the air at obne time during the various set-pieces, which included the naval aircraft (including Eddie Kurdziel's Firefly), a Korean War re-enactment (featuring the Air Museum's F-86 and MiG-15, newly-repainted into North Korean markings for the show, and a T-33 and T-6 'Mosquito') and the finale, including up to 14 P-51s, the Lyon Air Museum's B-17 'Fuddy Duddy, 2 P-38s and a P-47 orbiting overhead the field. Amongst the AAF fighters was another old friend, the Paul family's RAF desert-schemed P-40E, operated by OFMC from Duxford for a number of years in the late-1980s as 'Sneak Attack'. Clay Lacy flew a nice aerobatic routing in Joe Clark's 1966 Learjet, with smoke, and Brian Sanders flew his customary polished aerobatic routine in the family's Sea Fury 'Argonaut', with the wingtip-mounted 'Smokewinders' providing a graphic demonstration of the effects of wingtip vortices. 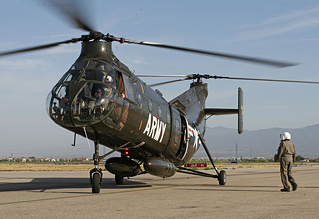 Among the static displays were the tandem-rotor Vertol H-21 Shawnee from Classic Rotors at Ramona, powered by a Wright R-1820 radial (which made a most distinctive sound when it landed on the Friday before the show) and a newly-restored TA-4J Skyhawk which flew in from Arizona still in an unpainted finish. Rudy Frasca's Flug Werk FW-190 was present on static display, oil cooling problems during its 4-minute initial test flight in the hands of Steve Hinton on the Thursday keeping it firmly grounded over the weekend. All-in-all, another excellent Chino warbird show. Well worth the trip from the UK to attend if you ever get the opportunity, the organizers always try to bring something fresh to the event each year. Left to right: John Alison, Bud Anderson, Bill Spengler, Bill Holloman, Vi Cowden, Huie Lamb, Wilbur Richardson, John Doolittle.